Tom had recently purchased a 22yr-old Jeep Wrangler whose purpose was to open up some backcountry roads to adventures not reachable by his Honda Element. He readily agreed when I suggested Death Valley might be a good place to try it out. For my own part, I had several dozen P1Ks in the area that I was interested in, most of which could be more easily reached with such a vehicle. Some of my first proposals, such as Titus Canyon, were poo-poohed as not challenging enough - the Element could easily drive that one. So I set about finding yet more challenging roads that would give Tom a chance to see what the Jeep could do. One of the ones I settled on was Goler Wash/Mengel Pass. I had been up this rough road with Matthew in his Outback five years earlier to do the DPS summits of Manly and Needle. We had gotten as far as the top of Mengel Pass but stopped there because the north side appeared too rough and we doubted we could get back up it. Since that time, a heavy thunderstorm had dumped volumes of water in the canyon and transformed the road into something less navigable. Adam Jantz was of the opinion it was undriveable whereas Tom had read that someone had fixed the worst of the damage by removing some large rocks. I didn't really know whether we could get up the canyon or not even in the Jeep, but at least Tom would be unlikely to complain that it was too easy. We would get our money's worth, to be sure. Having spent the night at Ballarat, we were up around 6a for what I expected would be a pretty full day. I had three P1Ks in mind along with Striped Butte, all located in or near Butte Valley on the north side of Mengel Pass. We did not get an early start because we found one of the Jeep tires flat even before we set out. Somewhere on the way to Ballarat the Jeep had picked up a shard of metal which had allowed the tire to go flat overnight. We did not take this as a good omen. Luckily we had a repair kit (in fact, two - Tom and I were each carrying one). Tom hadn't used it before but I had become quite familiar with it from some half dozen patches I'd done on vehicles over the years. We were delayed some 45min before we were ready, packed and on our way. Much of the road south of Ballarat is in excellent condition that any vehicle could drive, thanks to an active mine some 4-5mi down the road. In fact, plenty of vehicles presumeably from the mine had come by at odd hours during the night. Whatever they are extracting, it seems important (or at least profitable) to continue operations 24hrs a day. We wondered if the workers were coming on and off shifts or perhaps just sneaking away for a few drinks at a watering hole in Trona. Past the mine the road gets a little rough, but still manageable by anything other than a low clearance vehicle. We brought Karl's Element the fifteen miles south to the mouth of Goler Wash where we left it in case it should be needed if we ran into trouble - it would save us the long walk back to Ballarat. We piled into the Jeep and headed up Goler Wash. We weren't 15min up the canyon before finding the crux at what we called The Waterfall. Someone had piled up some rocks at the base of a 3-foot step to make things easier, but we were less than convinced. Karl and I got out to help guide Tom up (and photograph the fun). The engine revved, the clutch slipped and the Jeep bounced like a toy car, but it bullied its way up in the end. We would spend another hour making the rest of our way up the canyon to Mengel Pass, stopping only briefly to check out an old mining cabin still used for overnight visitors - hantavirus, anyone? A lone burro did not seem much troubled by our passing, watching us passively as we slowly puttered by. We were happy to find no further serious problems. We stopped at the pass to make a visual check of the route down the north side before committing the jeep in that direction. There is a section perhaps 30yds in length that gave us some concern, knowing that it would be tougher going back up than it would be going down. We at least had the knowledge that there was an easier, albeit longer way out if necessary, adding more than three hours and 140mi to the return time. Once past this second crux the route grows increasingly easier as we descended to the bottom of Butte Valley. This picturesque valley on the east side of the Panamints was not as deserted as I had expected. A car was parked outside the Geology Cabin (we would revisit with both the cabin and its overnight visitors later) and throughout the day there were perhaps a half dozen other visitors touring through by jeep or motorcycle. As far as we could tell, all of these came up the easier route from the east starting at Death Valley. With Manly Peak rising majestically on our left as we entered the Butte Valley, talk turned to this DPS summit. I had visited it some years earlier, but neither Karl nor Tom had climbed it. Tom had planned to follow me on whatever obscurities I had picked out whereas Karl was more eager to tackle Manly because "It's on the list!" Tom found himself lured by Karl's siren call. Making plans on the fly, I suggested they might go off and climb Manly while I tackled Striped Butte, a small standalone summit rising from the floor of the valley. It wasn't one of the P1Ks I had on the agenda, but it was interesting-looking peak and gets mention in Zdon's book. I knew it would take me far less time to do Striped Butte, but I was more than willing to change plans especially since it was Tom's jeep. Future jeep trips would undoubtedly require keeping the driver happy. And besides, I've long given up the idea that I've paid a last visit to an area by "clearing it out." In fact, I'm more than happy to find reasons to come back. And so they dropped me off on the south side of the butte before heading further south towards Manly. I kept track of their progress as much as I could in order to see where they ended up parking. I would make my way in that direction after I was finished with Striped Butte. Near where I was dropped off could be found a lone couple in an elaborate camper van where they'd set up shop for the past few days. They were busy packing stuff up as I passed by but would be more than an hour in packing it all away. 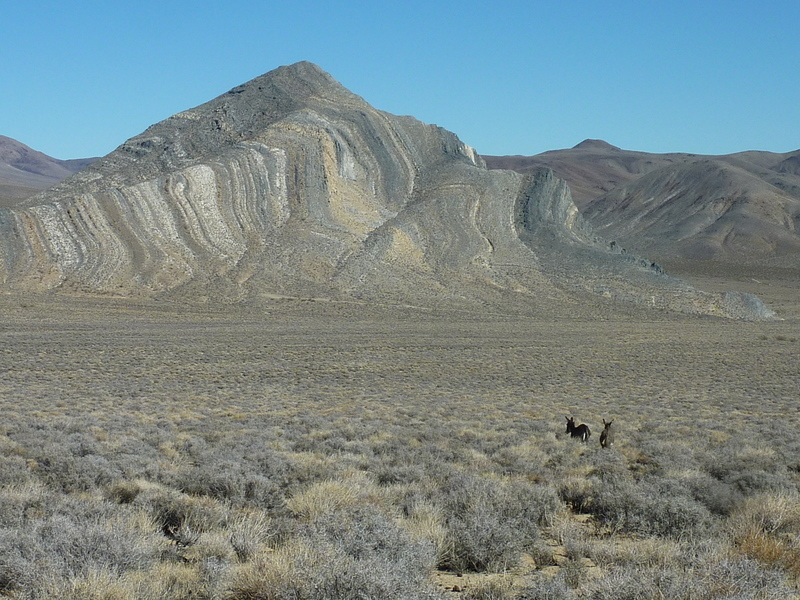 As the name suggests, Striped Butte is composed of a colorfully striped array of folded rock layers giving it an interesting look (it was originally named Curious Butte). The rock is primarily metamorphic limestone. The route up the South Ridge is easy enough at class 2, taking all of about 30min to reach the summit some 500ft above the floor of Butte Valley (more like 900ft on the lower east side). A large register container holding several books filled with names dating back about a decade attests to the peaks high popularity. There were simply too many entries to bother trying to photograph them all. From the summit I could easily discern the major peaks around Butte Valley - Manly to the south, Needle and Sugarloaf to the east, Gold Hill to the north. The far higher wall that forms the Panamint crest dominates the view to the west. To the southwest could be seen the genteel-looking Redlands Pass through which Manly and Rogers passed on their way back to Death Valley in 1848. Knowing I'd have plenty of time, I descended Striped Butte to the north (also class 2) and then circled around the east side to my starting point at the southern end. The couple were just finishing their packing and drove off a few minutes after I'd passed them for a second time. I continued south on the gravel road towards the base of Manly Peak. I had not been able to pick out exactly where they had parked, having lost sight of the jeep after it reached a distinctive clump of rocks. Rather than follow a straight line path across the desert I followed the road because I was interested to know if I'd be able to tell their tire tracks from the others when I reached a junction. This might help later when I tried to figure out which road branch they'd ended up on. Sadly, I was unable to - there was just too much recent traffic on the road and my tracking skills are lacking. When I reached the clump of rocks I found the road branching in several directions. I started up what I thought was the more likely route, but soon realized they might drive back out from another branch of the road and miss me entirely. Butte Valley is a big place and it would be easy to get separated. Shouting across the valley to be heard was unlikely. What to do? I decided to hang out atop the rock clumps and wait for them to drive by. An hour went by as I contemplated the fate of the Death Valley 49ers who had to wait for Manly and Rogers to return and rescue them (most of them, it turns out, found their own way out). I moved to a higher bit of rocks where I could get a better view to scan the north side of Manly, looking for them descending the mountain or discovering where they'd left the jeep. In the shadow of the mountain at Hatchet Spring I saw what might be the jeep or possibly a big rock. I went off to investigate. I kept looking back over my shoulder lest they might come driving back another route. Before I could ID the jeep I noticed Karl descending the last part of the mountain down to the spring. A few minutes later I caught up with them driving back down. It was almost 1:30p now, the Manly hike taking longer than we'd guessed - it's higher than it looks and the summit is actually set back from what appears to be the highpoint when viewed from the north. While we had plenty of daylight, we still had to negotiate the return over Mengel Pass and down Goler Wash. Doing those in the dark seemed ill-advised. I suggested we leave Gold Hill and the other P1Ks for another visit and instead, assuming we successfully make it back to Mengel Pass, that we visit an easily reached, unnamed summit just east of the pass. On our way back, we stopped at the Geology Cabin at Anvil Spring to pay it a visit. Both inside and out, it was the best maintained cabin I'd seen among a number of those sprinkled throughout Death Valley. Half an hour later, as we neared the crux, we spotted a woman and child walking down the road. They were part of the foursome that had spent the night at the cabin and had gotten their less-capable vehicle stuck trying to get past the crux. We had no idea where they thought they might get to on foot, but we suggested they might join us to see if we could collectively get the car unstuck. They were a somewhat odd group, the woman and her boyfriend in their 40s (perhaps) and her two children around 10-12yrs old. The children were both annoying, appearing unused to discipline in their lives. The boyfriend would not look you in the eye when he was talking, but rather ponder off in space as he propounded on whatever thought he was forming out loud. The woman appeared a little annoyed by it all. As well she should be. They were heading up over Mengel Pass based on the boyfriend's recollection of what he remembered from "some years ago." The vehicle, a GMC Jimmy, looked insufficient but had performed remarkably to get it where it was without any damage that we could see. They hoped we might be able to tow them over the pass but that was out of the question. For one, their vehicle blocked any route around it, and secondly, the 4-cylinder jeep would have enough trouble on its own. We suggested they might try backing the car back down and exit the way they had come. They weren't sure they had enough gas to do this, but running out of gas closer to the pavement was certainly better than staying stuck or trying further to get over the pass (they said they'd been working at it for two hours before we arrived). We had some spare gas, and with that enticement he agreed to heading back. The car was extracted and turned around. Tom then drove his jeep bravely over the rather large rocks, bouncing all over the place, past the worst obstacles before stopping the jeep against an immovable rock on the side. The new bumper he'd had installed got tweaked, but we managed to get it over the worst of it. We then gave the others some gas from our spare can and went our separate ways.